American culture has a deep belief that being average is akin to being a failure. Everybody wants to be above average. Unfortunately, this desire to be above average rarely works out to our advantage in the field of investing. It leads us to such endeavors as stock picking and timing the market, both of which tend to be counterproductive for most investors. As far as I can tell, the primary reason that people are reluctant to invest in index funds is that their egos get in the way. Ironically enough, with index investing, accepting “average” returns virtually ensures that you’ll come out ahead of the majority of investors. What would your thoughts be if I recommended the following investment plan for an investor aged 25? A handful of people might say that it’s a bit on the aggressive side. But I bet most people would say that it looks like a fairly reasonable, well-thought-out strategy for a young investor. Now what if I had made the following recommendation instead? Put 100% of the portfolio into Vanguard’s Target Retirement 2050 fund. The odd thing is that these two recommendations are the same thing! Again, our egos get in the way. We seem to have a perverse desire to make investing more complicated than is necessary. We want to feel sophisticated, and putting 100% of an IRA into a target retirement fund just doesn’t fulfill that need. Do your best to set your ego aside when making investment decisions. Don’t do something just to feel smart. With investing, the simplest strategy is often the best one. In a comment on last week’s post about the psychological benefits of index funds, Kevin pointed out an article from Motley Fool arguing that the problem with index funds is that they don’t make any attempt to separate good companies from bad companies. And as a result, they end up investing in companies that perform poorly (like the financial sector over the last year). The author of the article suggests that a strategy could be developed for running stocks in the S&P 500 through a number of mathematical equations to see which ones should be kept in the fund and which ones should be eliminated. This type of strategy is known as quantitative analysis because it considers only mathematical (i.e., “quantitative”) factors when analyzing a company instead of including subjective criteria such as strength of management, brand name advantage, and so on. To me, there’s one big potential advantage for quantitative strategies: Since they’re purely mathematical, they can be (almost) entirely automated. This allows for a fund using a quantitative analysis strategy to have far lower operating costs than a fund that uses teams of researchers to manually research companies before investing in them. However, there’s no way that any actively managed fund–even one using an automated strategy–can have lower costs than a (Vanguard) index fund. Why? Two reasons. First, a quantitatively-run fund needs data. Lots of it. Generally, this data comes at a price–whether paid for directly or paid for in terms of labor-hours from researchers. Second, a quantitatively-run fund is (most likely) going to have higher portfolio turnover than an index fund. And as we’ve discussed before, portfolio turnover leads to significant (albeit unreported) expenses. It worked once…but will it work again? My second issue with quantitative strategies is that there’s no way to know for certain if they’ll work in the future. The fact that they worked in the past doesn’t necessarily mean anything. Given that there’s a functionally infinite number of quantitative strategies an investor could use, there’s also a functionally infinite number of ones that would have outperformed an index over any given historical period. Look long enough and you’ll find one. Look even longer, and you can find some that have worked historically, but are clearly nonsense. Example: U.S. stock market movements have been shown to have very high correlation to butter production in Bangladesh. In the Motley Fool article, the author performs a backward-looking test to see how his strategy would have performed. And…surprise surprise! It beat an S&P 500 index fund. My question: Was this the first quantitative strategy the author tried? Or did he also run the numbers for a handful of others which ended up underperforming the index? As they say, we don’t call the man who won the jackpot at a slot machine an expert on probabilities. Similarly, the success of any given strategy over a particular historical period could have been purely luck. A strategy has to outperform the index for an extended period of time (think: multiple decades) before we can attribute it’s success to anything meaningful. …it’s entirely possible that some fundamental shift could occur that causes the strategy not to work as well in the future. If you want to try to beat the market, a quantitative analysis fund could very well be your best bet. Personally, however, I’m going to be sticking with a strategy based on simple arithmetic–arithmetic that will apply over every extended period: Lower costs means greater returns. Target retirement funds are mutual funds that hold a group of other mutual funds run by the same company. They come with names like “Retirement 2040,” which–unsurprisingly–would be used by investors who plan to retire in 2040. The idea is that target retirement funds automatically adjust their asset allocation toward more conservative investments as the retirement date draws near. They also automatically rebalance the portfolio on a regular basis (usually annually) to ensure that the investor’s asset allocation is appropriate for his or her age. First, you’ll have to choose which fund company you want to use (unless we’re talking about a 401k in which you don’t have a choice of different fund companies). I’d suggest looking for a company that uses index funds (as opposed to actively managed funds) to make up their target retirement portfolios. But that’s up to you. The main consideration should be to make sure that the accompanying expenses are low. Check to make sure that the target retirement fund doesn’t add an additional level of expenses beyond those charged by the underlying funds. Update: Apparently Morningstar went and did this research for us. The conclusion is that Vanguard’s target retirement funds cost just 0.18% per year, and the next cheapest alternative (Wells Fargo) costs more than three times as much! After choosing a fund company, simply take a look at the fund with a retirement date closest to when you expect to retire. Then perhaps adjust 5 years either direction if the asset allocation appears too aggressive or conservative for your tastes. It can feel somewhat risky putting your entire account into one fund. Almost like an “all your eggs in one basket” sort of situation. But that’s simply not the case. In reality, you’ll own a handful of funds, each of which holds hundreds–or even thousands–of different investments. You’ll be extremely diversified. It’s entirely reasonable for an investor to put her entire retirement account into a low-cost target retirement fund that matches her desired asset allocation. In fact, if you’re convinced as to the advantages of indexing, there’s hardly any reason why you wouldn’t want to use a target retirement fund. They add no costs, and they take care of rebalancing for you. What’s not to love? Some people, however, will argue that target retirement funds are simply too boring. I’ve never much understood that viewpoint. To me, retirement investing is not a game. This is your future livelihood we’re talking about here. The point of investing isn’t for it to be fun or exciting. …a low-cost target retirement fund is very hard to beat. Not-to-be-overlooked bonus: Your investment results are likely to be significantly better than they would be if you were picking stocks or trying to find this year’s hot fund. Are stocks safer than bonds? If you’ve done any reading about investing, you know that stock market returns are unpredictable over short periods and predictable over long periods. And you also know that–over long enough periods (however long those may be)–stocks outperform bonds. However, until I started reading Jeremy Siegel’s Stocks for the Long Run, I’d never heard anyone make the case that–over extended periods–stocks not only earn greater returns than bonds, but more predictable returns as well. In other words, not only do stocks earn more than bonds, they are actually safer investments for long-term investors. How does Siegel reach this conclusion? In short, he compares the range of after-inflation returns of stocks to the range of after-inflation returns of bonds over periods of various lengths. Unfortunately, the data in the edition I have only goes through 1997, and I was curious to see how the conclusion would hold up after updating for the last decade. Time to pull out the spreadsheet and plug in some numbers! Updated for 2008: Are stocks less risky than bonds? 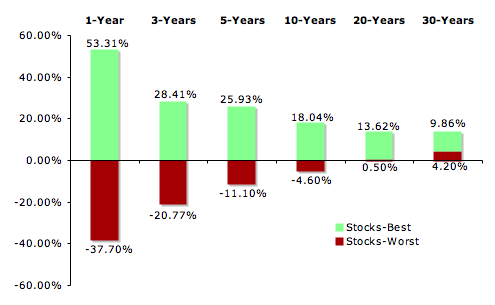 The chart below shows us the best and worst stock market returns (after inflation) over periods of various lengths. As you can see, the real return from stocks becomes much more predictable as you look at longer periods. For example, the worst 1-year real return for stocks was -37.7%, but the worst 10-year real return for stocks was a compounded -4.6%. The next chart shows the same thing, but for bond returns (as measured by the total return on 10-year U.S. Treasury bonds). As with stocks, the returns become more predictable as we look at longer and longer periods. 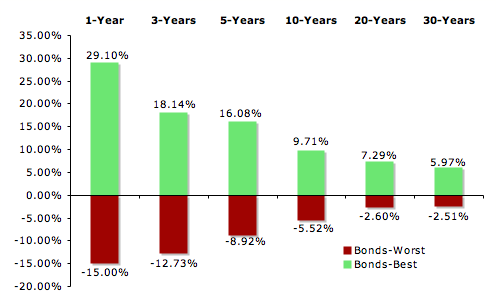 The following chart essentially combines the previous two, allowing us to compare the range of bond returns (from best to worst) to the range of stock returns over periods of varying lengths. 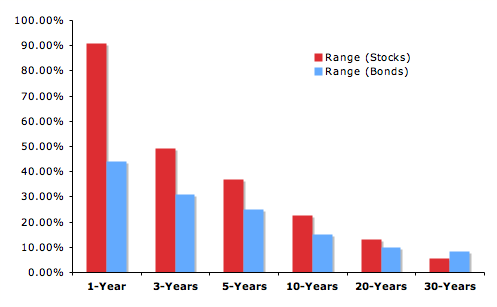 Over short periods, the range of stock returns is much greater than the range of bond returns. For example, the worst 1-year real return for stocks was more than 90% worse than the best 1-year real return for stocks. In contrast, the worst 1-year return for bonds was just over 40% worse than the best 1-year return. (This is–in part–why people refer to stocks as “risky.”) But look at those 30-year ranges! The range of after-inflation returns for stocks actually becomes lower than the range for bond returns. 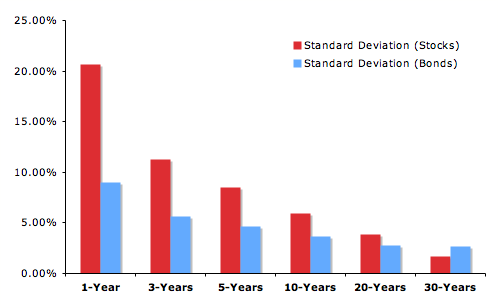 In other words, stocks are more predictable (ie, safer) than bonds over periods of 30-years. And for any statistically-inclined readers, our final chart shows the standard deviation of real returns for stocks and bonds. Again, we see that 30-year real returns for stocks are more predictable than 30-year real returns for bonds. If you’ve got a 30-year investment time frame a heavy allocation to stocks just makes sense–not just from a total return point of view, but from a risk point of view as well. The catch: You can’t bail out and sell when the market drops. Otherwise you don’t get those nice, predictable 6-7% after-inflation returns. The period considered is 1928-2008. The yearly returns are for calendar years. Bond data and inflation data comes from the Federal Reserve Bank of St. Louis’ research site. Stock return data is from Aswath Damodaran, Professor of Finance at the NYU Stern School of Business. Try and avoid the worst hazards of behavioral investing. Follow the basic rule that I follow: Don’t peek. Don’t look at your account. Throw the 401k statement in the trash when it comes. Agreed. The more often you look at your account, the more you’ll worry about it, and the more likely you are to do something you’ll regret later. The attitude is to try and have an investment portfolio that you don’t need to worry about. To file it and forget it. It is adaptable–it exists across the world in countless different social and political environments. It is persistent–I imagine it will stick around as long as humans do. To bet against it is foolish. Entrepreneurs and businesses earn profits. That’s what they do. Claims that “buy and hold investing is dead” are nonsense. It will always be profitable to own businesses (provided you own a sufficiently large quantity of them and you own them for a long enough period). *In case you’re curious, I call it entrepreneurship, and I believe it has an overwhelmingly positive effect in the world–though not when left entirely unchecked.